Doubling up on a few of my favorite things. Denim bomber jacket c/o Boohoo, J brand Maria high rise leather pants, Abercrombie chambray lace-up tunic, Petit Sesame fringe bucket bag, Oliver People's West Hobson sunnies, Jevan suede mules c/o Vince Camuto. Shot by Isaac Lacey. There are certain pairings in life you just don't mess with. Avocado + Toast. Tanqueray + Tonic. Wine + Cheese. Sure, they're all fab solo, but put them together and they combine seamlessly to bring out the best qualities of one another. Denim and leather is one such pairing. Worn alone they're both pretty cool, casual staples. But when tossed together, they all of a sudden acquire a level of style confidence that's sure to elevate your game. There's something inherently laid-back but edgy about the combination that I love, plus it's so easy to work into your wardrobe in new ways. Already have a leather jacket? Try pairing it with a denim dress or culottes instead of your go-to jeans. Sick of wearing jeans most of the week? Invest in a pair of leather (or vegan leather) skinnies or skirt to give your outfits a chic boost, then top it off with an oversized denim jacket or bomber. And don't be afraid to get creative! Trust me, this is one outfit duo you'll be styling together for years to come. 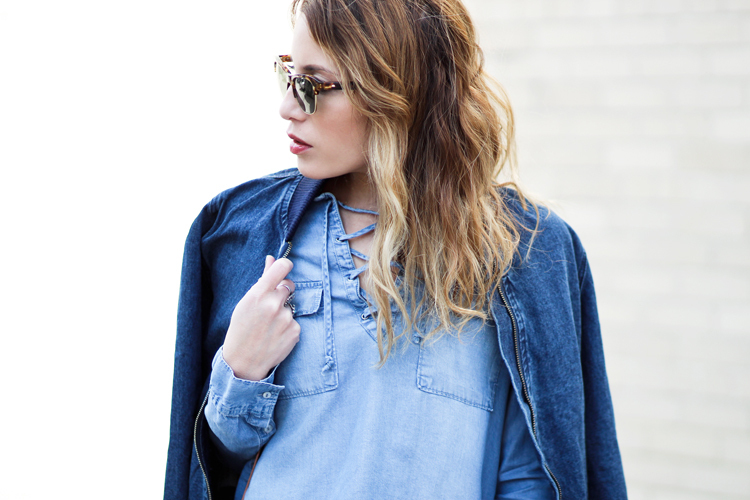 I love the lace-up detailing of the chambray top. It's a very fun and feminine neckline. Great post! 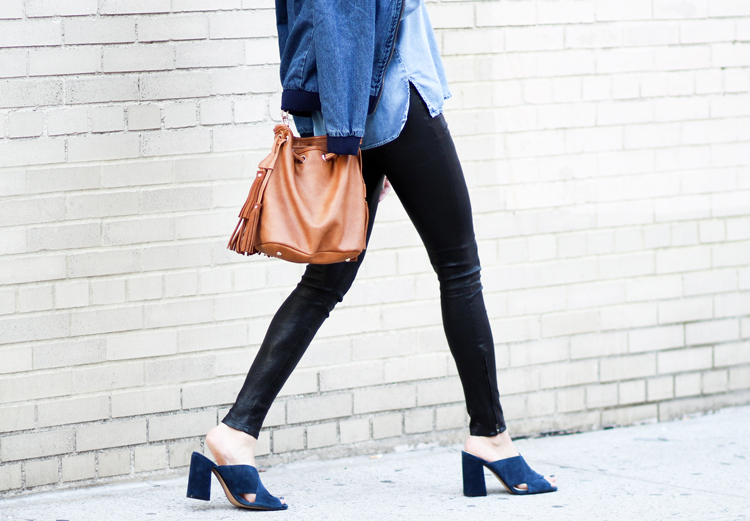 Love the denim shirt and the mule sandals are so cool! Two denim combinations definitely work - no matter what people say!